Great way to track my water intake. So easy to use! 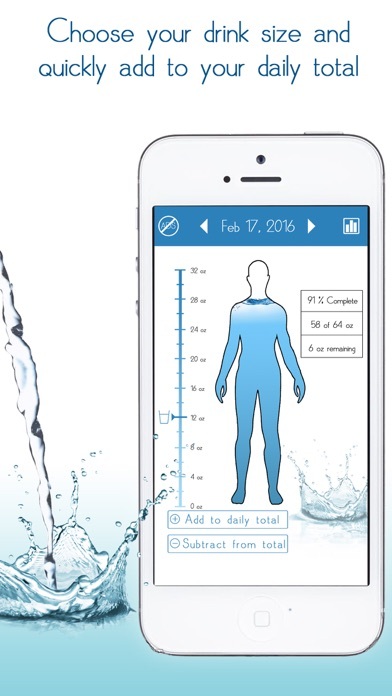 I love this app because it allows me a visual reference to “filling” my body with hydration. Use the trial and you’ll probably find this application the best reminder and tracker. Blessings Ya’all. The extended display of confetti falling every time I took a drink was just too annoying. Many apps track fluid intake. This one was just too annoying to keep. Once you set up your water goals you are out of luck if you want to adjust these levels. I just payed $5.99 to this company and wished I would have done a little more testing before I paid for the ad free and tracking. For .99 per month you don’t get much. And it really should say up front that if you get the app it is really only a trial. That is not clear IMO. For the money there are several other apps to do the same thing at a lesser price. And as I said you really don’t get much. 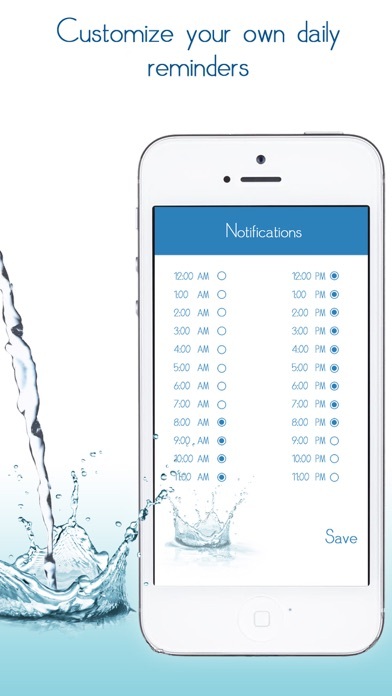 In fact you could set your own alarm and keep track of your water on paper or in your Notes. I like this app, but I really don’t like being forced to “leave a five star review” to keep using it. I am leaving you a one star to counterbalance the five you demanded. Very helpful during pregnancy. I naturally do not drink enough water and this app is making me stay on track to making sure I get adequate water intake during my pregnancy. It’s good. Already recommended it. Only exception - they hijack you for a five star rating. But then the day is stuck on yesterday and will NOT arrow forward without purchasing the upgrade. Nope. Deleting. I hate that I have to download each app to find and compare premium prices! This is a cumbersome app. I just want to open and do a quick tap. I don’t need the applause and confetti each time I add ... it annoyed me. There are so many hydration apps. That’s a ridiculous price for ad-free one. It’s a simple concept. Don’t make it complicated. I deleted this app immediately after I saw some shady things. I’m ok with in-app purchases but don’t advertise the bast value as $0.99 / month. When you offer an unlimited option of both for $5.99. $6 one time vs 0.99/month? Please don’t think we are stupid and cannot math. Then I opted to do the seven day free trial. And after I agreed to that I got an ad. Seriously? Can’t have it both ways. Those two things made me think they are just shady and deleted the app. Looking elsewhere! 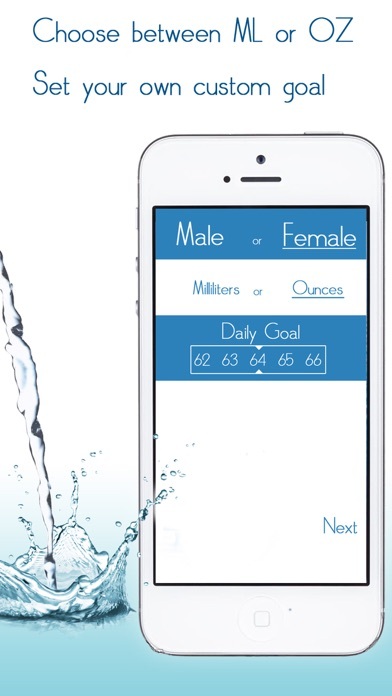 I like using this app to keep track of my water intake. I couldn’t get past the home screen because I couldn’t decide on “male” or “female”; add more options or “rather not” pls. This app is so easy. Download today and start your health journey. Thus has. Are my first week great! Here e go week two! The reminder is nagging bugger. But it really keeps me on track with my intake. For a free app it works great. I could care less what I did yesterday. Today is what counts & it lets you know how much more you need to drink. They try to manipulate the user into leaving a 5 star review. Also, you can’t adjust your water goal after the initial set-up, unless you want to pay. Complete baloney. Looking for a new tracker. Best water tracker app that I’ve found! I love the updates to remind you to get your water consumption in. Also shows you how much more you have to go and how much has been completed. Highly recommend if you struggle with consuming water! My favorite water tracker. It’s simple and easy to use. No complaints. This app is fun! It takes a chore, and makes it fun to do! I enjoy the way it cheers and throws confetti when I add to my water. However, I do not like to be manipulated. I feel that the way the payment is set up is deliberately unclear. It explains the $.99/month as a recurring monthly debit from your account of 99 cents. The onetime payment of$5.99 leaves more questions than it answers. 🤨 $5.99/month would be a onetime payment of$71.88+tax! I won’t pay that until I know know exactly what I am paying for!! My Review This is the SECOND time I have asked you to end my subscription, and, not only have you not complied, you have refused to acknowledge my request! I gave you 1 star because I didn’t think I could give you no stars. I started keeping track of my water intake on Oct 1, and I really liked this app until today Oct 16, I tried to look at what my intake was yesterday and it won’t show me unless I upgrade by paying $.99 a month. No thanks! App is great until you have to start paying for it. For a free app I like this one the best. I like that you can add and subtract to & from it. Easy to use and can set reminders. This app is awesome. 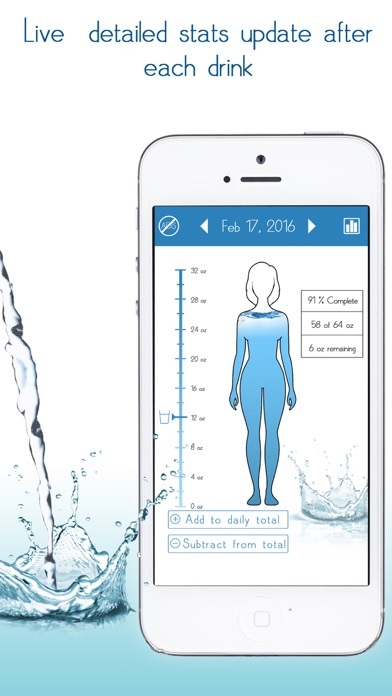 I’ve been on a journey to lose weight and this app has helped me stay accountable with my water intake. If you don’t drink Water you definitely will have problems loosing weight. The cheering makes me laugh every-time. I love this app! It’s very simple but does exactly what I need it to do. At first the hourly reminders were a bit much for me, but then I realized I could change the frequency. I also get notifications on my Apple Watch which I like. Keeps me on track! When I downloaded this app I thought it was free. Then I get hit with the in order to continue leave 5 stars or pay the $5.99. What a bummer. If they'd been upfront about it, i would probably have tried it anyway. As far as the app is concerned, it does just what I needed it to do. Reminding me every hour really helps. I only drink water and thought I was getting enough daily, I was sadly wrong. 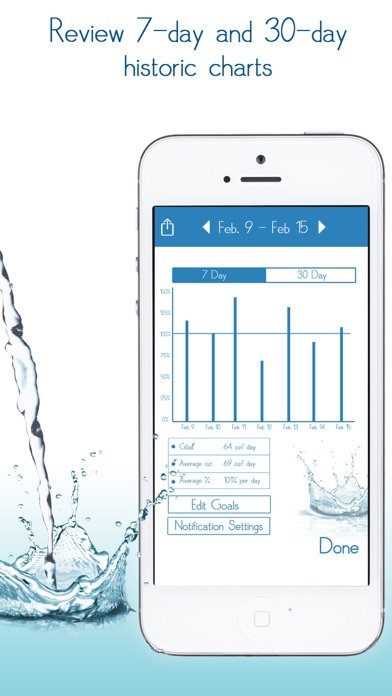 Love this app for keeping track of my daily water intake. You can customize the notifications so that it is not bugging you all day but does give you enough reminders to get in your daily ounces. Very easy to use. Our whole family now uses it. As far as water tracking apps go- this one pretty nice. It’s simple and easy and quick. I actually have been sticking to it for a few days now which is not like me because I usually lose interest and just stop using apps. I like it- would recommend. I love this App! Only thing I wish is that I could look back and see when my last entry was. Every once in awhile I can’t remember if I forgot to enter an amount I drank.